Inherent memory leaks in iOS or MonoTouch? We are battling with memory leaks in an iPad app that has to be stable enough to be able to keep running for 24/7, as such, memory leaks are intolerable. As a simple test, we created a new iPad MonoTouch project, using the "Single View" template, and executed it using Instruments on the iPad itself (iPad 3rd gen, no other apps running/in memory). The app is literally doing nothing on our part, but clearly something is executing that allocates memory. Is this an iOS problem, a MonoTouch problem, or something else? Is the plan to create a 24/7 iPad app realistic? We fear that when we start adding code, the amount of memory leaks will also escalate. The app could clearly run for quite some time with the leaks in the above image, but if it ramps up, the deadline for memory full will be hit much quicker. The screenshots shows allocations - not memory leaks. You can ask Instruments to track leaks, i.e. where no reference is found to the allocated memory. However it's not possible, without more data, to say if those are normal or not. We need, at least, to know where are the allocations coming from ? Instruments can tell you more details about each allocation. Try drilling down the tree under each heapshot to see where the allocation comes from. Similar situations are often due to caching - and that's done at every level. 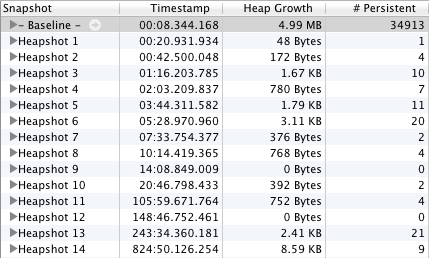 Outside the application code you'll notice that iOS and it's frameworks doing caching (e.g. images, webkit ...). Mono itself does caching and also uses memory pools that will grow when needed. An allocation (even if freed) will be shown but it's not a leak - when freed the memory will be, if possible (e.g. size) reused. Of course it could be a bug too (in the app, any framework, mono touch, iOS). Given time a single, small leak is enough to crash an app if it occurs at the wrong place (e.g. part of a run loop, processing notification...). Only finding where the allocations comes from and if they are repeated allocations (from the same source) will tell you how critical those are. So I did an experiment with my own application last night. The screenshot below shows the heap growth over 13 hours and 45 minutes. For the first 4 hours (1-13) the application was on foreground. The last part (14) the application was on the background (screen off for the night). The recording was also stopped after #14 so that number did not have a chance to go down over time. My application is a bigger (initial baseline at 5MB) and I did not use it after it's startup. My first "Mark Heap" was done once I knew initialization was complete (it's loading a quite large, 80MB database). OTOH also listen to network events, using NSNetServiceBrowser, that callback into managed code (without any visual clue). Expanding Heapshot #1 shows a single object, 48 bytes, with a stacktrace ending with _ZL13_cache_mallocm, cache_fill, lookupMethod, _class_lookupMethodAndLoadCache3... there's nothing of my app or mono shown higher in the callers. Expanding Heapshot #2 shows four objects, the first two with CA::Render::Encoder::ObjectCacche::invalidate(...) and CGNotificationCenterPostNotification in their stack trace. The third with _cache_addForwardEntry, the fourth looks like Heapshot #1 but, like the 3rd, it comes from _XReceivedStatusBarDataAndAction (not something directly done by my app or monotouch). Expanding Heapshot #3 shows 10 objects... a bit long to list them, however they are all under the same _XReceivedStatusBarDataAndAction call. Same pattern when expanding heapshot #4. Heapshot #5 has one difference (out of 11) where the allocation comes from a dispatch queue (_xpc_connection_init) but there's no managed (app) or mono[touch] stack frame visible. Same pattern (as #3) when expanding heapshot #6, #7, #8. Heapshot #9 is empty (no allocation). Heapshot #10, #11 like #3. Heapshot #12 is empty too. Heapshot #13 is mostly like #3 but it also cache same images, CA::Render::Image::caches_encoding() and another _cache_fill+lookUpMethod occured when a _significantTimeChange notification was received (not managed or MT stack frame below UIApplicationMain). A few other allocations are related to the notification. Heapshot #14 is mostly about notification (likely being told it's going to the background). There's again some _cache_fill allocations. There's nothing above that pointed to MonoTouch or even my app. OTOH I have not compared this to an ObjC app (and might not have time to do so) but I believe you'll see something quite close - depending on which API/services being used (and app doing the same thing should show the same allocations). Like I said before YMMV as leaks (or unintended memory retention) are often be API specific. If you find weird stack trace in your instruments sessions please fill a bug report (to Xamarin or Apple, depending on the stack trace) about them so they can be analyzed and fixed (if buggy). Is the plan to create a 24/7 iPad app realistic? As for running an app 24/7 I think it can be done - but it requires the cooperation of the user (which might be unrealistic). Switching to another application (home button, gestures) means your app won't be in the foreground and Apple can kill any background app to reclaim memory. E.g. App X runs out of memory and iOS starts asking, then killing, background apps to satisfy the foreground app. Not the answer you're looking for? 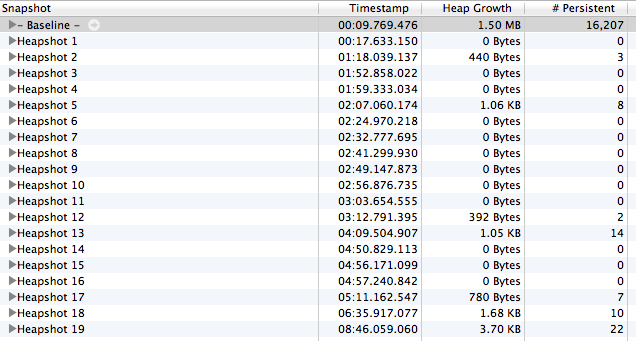 Browse other questions tagged ios memory-leaks xamarin.ios long-running-processes or ask your own question. Why does MonoTouch cause lots of memory leaks (as reported by Instruments) even with very simple Apps? MonoTouch - WebRequest memory leak and crash? Can anyone point me to some strategies for debugging memory leaks in monotouch? Getting memory leak in UIKit?